LIKE NEW WATERFRONT HOME with sailboat water to the Gulf! The original owners of this 2011 Jacobsen home have kept it spotless and well maintained. An open floor plan is enhanced by vaulted ceiling, drywall and beautiful wood laminate flooring throughout. Good work and storage space in the cheerful kitchen with corner window over the sink, newer dishwasher, disposal and fridge. Good sized master bedroom with private bath, guest room and guest bath in the hallway. Upgraded 6-panel doors, double-paned windows. Brick driveway is double-wide for 2 cars. The large shed has A/C and double doors – great for storing the golf cart when away. Bahama shutters are on east and west windows. You’ll LOVE the 12 x 17 porch complete with A/C and quality windows. 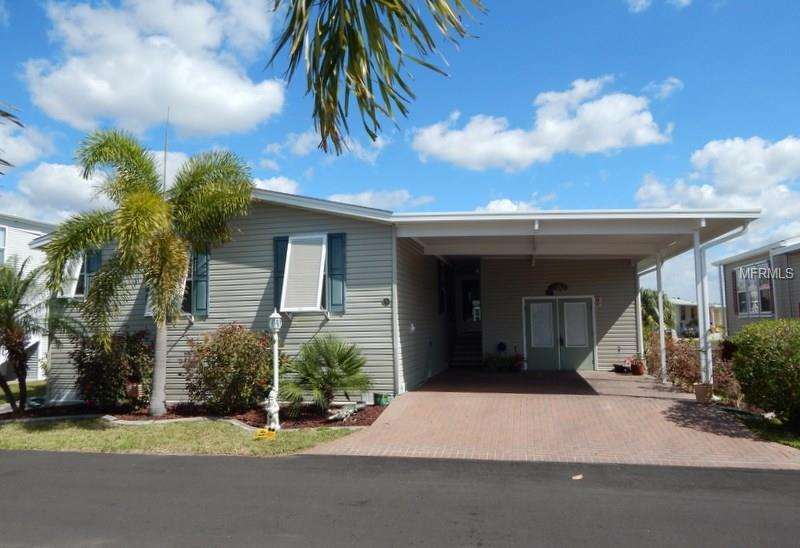 Access from the porch takes you to the tropical lanai on the waterfront. Windmill Village is an active, resident owned park with saltwater marina, fabulous clubhouse with library, billiards room and grand hall for dinners, dances and many activities. Enjoy boating, kayaking, horseshoes, Tiki Hut and heated pool. The low monthly fee of $190 covers lawn mowing, water & sewer and all recreation facilities. Price does not include the WMV park share and bond of $20,285 which is returned when you sell. Grab the bikes and fishing rods and come enjoy a fun lifestyle on the water!